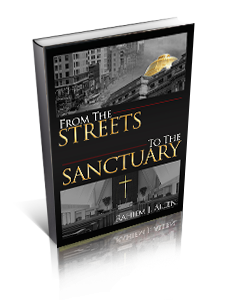 From the Streets to the Sanctuary is the story of my life, a life lived in a city that is called the bricks. In this city Newark NJ, I learned at an early age to live according to the flesh. This consisted of doing whatever I felt was right knowing full well it was wrong. My life was ruled by the prince of the air, the enemy of my soul. Then, to my surprise the Prince of Peace came in and overruled the sin that attempted to destroy his plan for my life. Now I am In the Sanctuary, walking living and loving the Lord seeking the savior and compelling my brothers and sisters to live a life of faith.